I think what's happening now is people want to forget. There was Vietnam, there was Watergate, there was Iran – we were beaten, we were hustled, and then we were humiliated. And I think people got a need to feel good about the country they live in. But what's happening, I think, is that that need – which is a good thing – is gettin' manipulated and exploited. And you see the Reagan reelection ads on TV – you know: "It's morning in America." And you say, well, it's not morning in Pittsburgh. It's not morning above 125th Street in New York. It's midnight, and, like, there's a bad moon risin'. And that's why when Reagan mentioned my name in New Jersey, I felt it was another manipulation, and I had to disassociate myself from the president's kind words. You ain't a beauty but hey you're all right. Oh and that's all right with me. Oh brother are you gonna leave me? My clothes don't fit me no more. If you come knockin' late at night. If the words you say are right. She'll let you deep inside. But there's a secret garden she hides. Another runner in the night. Blinded by the light. She got down but she never got tight, but she'll make it alright. I stood stonelike at midnight, suspended in my masquerade. I combed my hair till it was just right and commanded the night brigade. I was open to pain and crossed by the rain and I walked on a crooked crutch. I strolled all alone through a fallout zone and came out with my soul untouched. And your strength is devastating in the face of all these odds. Remember how I kept you waiting when it was my turn to be the god. And we danced all night to a soul fairy band. And she kissed me just right like only a lonely angel can. She felt just right just like as sweet as a spirit in the night. In the night baby don't know what she do to you? Spirits in the night, in the night. Stand up now and let her shoot right through you. Did you hear the cops finally busted Madame Marie for tellin' fortunes better than they do? For me this boardwalk life is through, babe. Rosalita jump a little lighter. Senorita come sit by my fire. I just want to be your love, ain't no lie. Rosalita you're my stone desire. Now I know your mama she don't like me 'cause I play in a rock and roll band. Darling you know just what I'm here for. Climb in back, heaven's waiting on down the tracks. We're riding out tonight to case the promised land. Oh Thunder Road, oh Thunder Road. You hear their engines roaring on. But when you get to the porch they're gone on the wind. Taking all the heat they was giving. And lined with the light of the living. Turn around the corner things got real quiet real fast. She hit me with a Tenth Avenue freeze-out. And you're just a prisoner of your dreams. To blow 'em away in the night. Hiding on the backstreets, hiding on the backstreets. In the day we sweat it out on the streets of a runaway American dream. At night we ride through mansions of glory in suicide machines. And steppin' out over the line. Baby this town rips the bones from your back. On a last chance power drive. But there's no place left to hide. Where we really want to go and we'll walk in the sun. The street's alive as secret debts are paid. Kids flash guitars just like switch-blades hustling for the record machine. Badlands, you gotta live it everyday. As the price you've gotta pay. That it ain't no sin to be glad you're alive. In the Bible Cain slew Abel and East of Eden he was cast. You're born into this life paying for the sins of somebody else's past. Daddy worked his whole life for nothing but the pain. Now he walks these empty rooms looking for something to blame. You inherit the sins, you inherit the flames. Tonight, tonight the strip's just right. There's a dark cloud rising from the desert floor. I packed my bags and I'm heading straight into the storm. That ain't got the faith to stand its ground. There's so much that you want, you deserve much more than this. But if dreams came true, oh, wouldn't that be nice? But this ain't no dream we're living through tonight. Something that they just can't face. Till some day they just cut it loose. Cheap romance, it's all just a crutch. You don't want nothin' that anybody can touch. Not walkin' tough baby, not walkin' cool. You walk cool, but darlin', can you walk the line? And face the ties that bind. Now you can't break the ties that bind. Well let there be sunlight, let there be rain. Let the brokenhearted love again. Now I don't know what it always was with us. We chose the words, and yeah, we drew the lines. There was just no way this house could hold the two of us. I guess that we were just too much of the same kind. No flowers no wedding dress. That night we went down to the river. And into the river we'd dive. I was gonna be your Romeo you were gonna be my Juliet. You wait on that welfare check. I don't wanna fade away. 'Cause darlin' I don't wanna fade away. Thinking 'bout the wreck on the highway. At least for a little while sir me and her we had us some fun. Well they closed down the auto plant in Mahwah late that month. Ralph went out lookin' for a job but he couldn't find none. He came home too drunk from mixin' Tanqueray and wine. He got a gun shot a night clerk now they call'm Johnny 99. I catch him when he's strayin' like any brother would. Man turns his back on his family well he just ain't no good. The times are tough now, just getting tougher. Well I'm looking for a lover who will come on in and cover me. And cut a six-inch valley through the middle of my soul. I can feel my heart begin to pound. You say you're tired and you just want to close your eyes and follow your dreams down. Now you hung with me when all the others turned away turned up their nose. Just to say goodbye Bobby Jean. I pull you close but when we kiss I can feel a doubt. My kisses used to turn you inside out. Friday night I'd drive you all around. But lately girl you get your kicks from just driving me down. And I'm going to drink till I get my fill. Well time slips away and leaves you with nothing mister but boring stories of glory days. You can't start a fire, sitting 'round crying over a broken heart. You can't start a fire, worrying about your little world falling apart. Last night me and Kate we laid in bed talking about getting out. Last night I sat him up behind the wheel and said son take a good look around. Well it's Saturday night you're all dressed up in blue. Well if you're looking for love, honey I'm tougher than the rest. Keep the world turnin' around. It ought to be easy, ought to be simple enough. If you want to ride on down in through this tunnel of love. I'll play the faithful man. But just don't look too close into the palm of my hand. I'm lost in the darkness of our love. Give me a little of that Human Touch. Well then here's to our destruction. So I bought a .44 magnum, it was solid steel cast. And in the blessed name of Elvis well I just let it blast. I can see by your eyes friend you're just about gone. Well here's to your good looks baby, now here's to my health. Tonight I got dirt on my hands but I'm building me a new home. But nobody’s kiddin’ nobody about where it goes. When I die I don't want no part of heaven. I would not do heaven's work well. To stand in the fiery furnaces of hell. His body lyin' on a muddy hill. Somebody killed him just to kill. Hell's brewin', dark sun's on the rise. This too shall pass, I'm gonna pray. Right now all I got's this lonesome day. May your strength give us strength. Musta been a tear from your eye. Musta been you sighin' so deep. Don't worry we're gonna find a way. Now I been out in the desert, just doin' my time. Searchin' through the dust, lookin' for a sign. If there's a light up ahead well brother I don't know. Can't see nothin' coming up behind. How far I've gone, how high I've climbed. But I don't know who to trust. We're a long, long way from home, Bobbie. I got God on my side. Crushin' the last lone American night. She went away, she cut me like a knife. My father said "Son, we're lucky in this town. It just wraps its arms around you. When they built you brother, they turned this dust to gold. When they built you brother, they broke the mold. Out of the East on an Irish stallion came bounty hunter Dan. His heart quickened and burdened by the need to get his man. He found Pete peacefully fishing by the river. Pulled his gun and got the drop. He said "Pete you think you've changed but you have not." Where fortune is not kind. Though trouble can feel like it's here to stay. Our love will chase the trouble away. Have you ever seen a one legged dog makin' his way down the street? If you've ever seen a one legged dog then you've seen me. I been knocking on the door that holds the throne. I been looking for the map that leads me home. I been stumbling on good hearts turned to stone. The road of good intentions has gone dry as a bone. Well, no cannon ball did fly, no rifles cut us down. No bombs fell from the sky, no blood soaked the ground. No powder flash blinded the eye. They brought death to my hometown. Tend to your flock or they will stray. We’ll be called for our service come judgment day. The blood on our hands will come back on us twice. Dreams will not be thwarted. We all come up a little short and we go down hard. These days I spend my time skipping through the dark. Through the empires of dust, I chant your name. I am the hunter of invisible game. 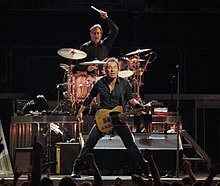 Our love is like a Bruce Springsteen concert. It's not that great, it's really long. But wow! What energy. 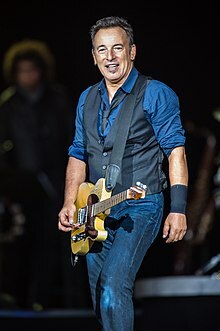 Whenever I see Bruce Springsteen do anything, he empties the tank. Every time. And the beautiful thing about this man is he empties that tank for his family, he empties that tank for his art, he empties that tank for his audience, and he empties it for his country. And we, on the receiving end of that beautiful gift, are ourselves rejuvenated, if not, redeemed.